Tech Wizard Iron Man: What is all this awesomness?! Doctor Strange: Kaecilius is on the verge of summoning beings who are beyond even the powers of the Sorcerer Supreme. This elemental armor amplifies my power, and provides extra protection in battle. 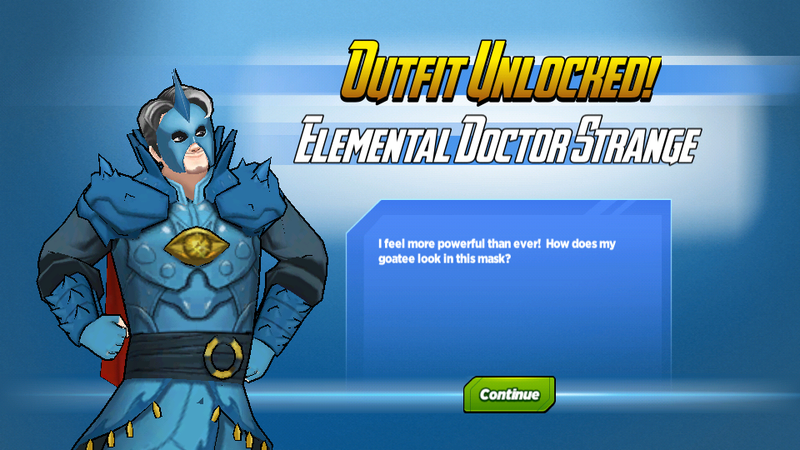 Tech Wizard Iron Man: Why is your element water? Because you're cold and sometimes slimy? Doctor Strange: Because I'm intuitive, adaptive, and mysterious as the ocean depths. Tech Wizard Iron Man: It also works because your palms are always sweaty. Kaecilius: Do you really think elemental armor will save you from what's coming next? Doctor Strange: I want to chop off your ponytail. Doctor Strange: It bothers me. I find it more disturbing than the Fear Eaters of Kkallakku. Kaecilius: Your vanity will be your undoing. Doctor Strange: I also don't like your mascara. Tech Wizard Iron Man: If you want, I can run some diagnostics on your new suit while you walk around. It might give you extra insight into how to harness its full power. Doctor Strange: Thanks, Tony. That's really nice of you. Tech Wizard Iron Man: That's science! Doctor Strange: I don't get it. 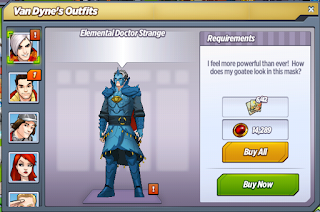 Doctor Strange: What were you able to learn about my elemental armor? Tech Wizard Iron Man: Huh? 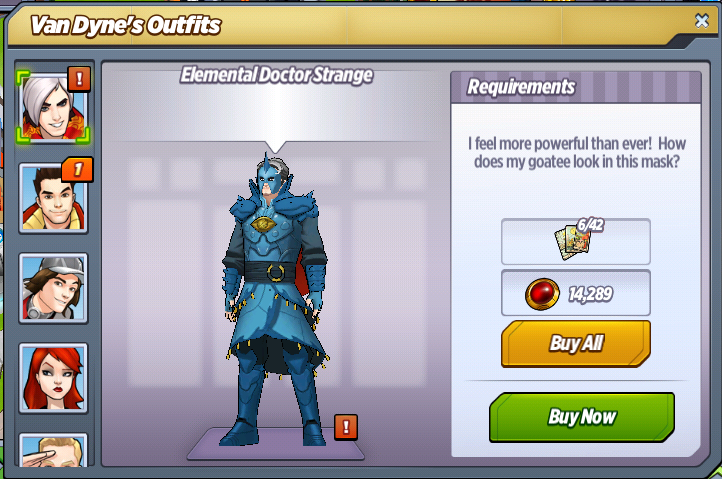 Doctor Strange: You said you would run diagnostics on the armor to help me harness its full abilities. Tech Wizard Iron Man: Right! I remember now. I was doing that, but I was also finalizing the designs for my Artic Armor, making tweaks to my Hulkbuster armor, and watching a documentary about a nun who makes her own cheese. 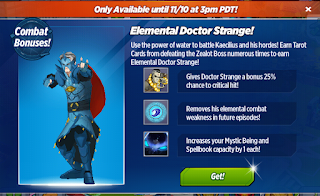 Doctor Strange: You didn't even finish the diagnostics. Tech Wizard Iron Man: Oh, I didn't even start. Do you think I could make it as a champion cheese-maker? That cheese-loving nun really got me motivated. Ms. Marvel: Whoa! You have water powers now?! Doctor Strange: In a sense. It's more like I'm harnessing the elemental force of water, and the energies of the sorcerers who've worn this armor before. Ms. Marvel: Bend some water! Doctor Strange: Yeah, I don't do that. Were you not listening? Ms. Marvel: I still wish you bent water, but that was some awesome teleporting! Doctor Strange: I do what I can. This armor honestly makes it a little more difficult to make the necessary movements to open a portal. Ms. Marvel: Have you tried Kung Fu?! Nick Fury: We need to have another talk. Nick Fury: Could be your imagination. Could be that if there's any hope of saving this world, I need to know that I can trust the Sorcerer Supreme. Doctor Strange: If what you're telling me is true, it's the most amazing, and the most terrible thing I've ever heard. Nick Fury: The past was terrible. The present is amazing. If we work together, the future could be beyond our wildest dreams. Nick Fury: I've been hanging out with The Ancient One at the barber shop. 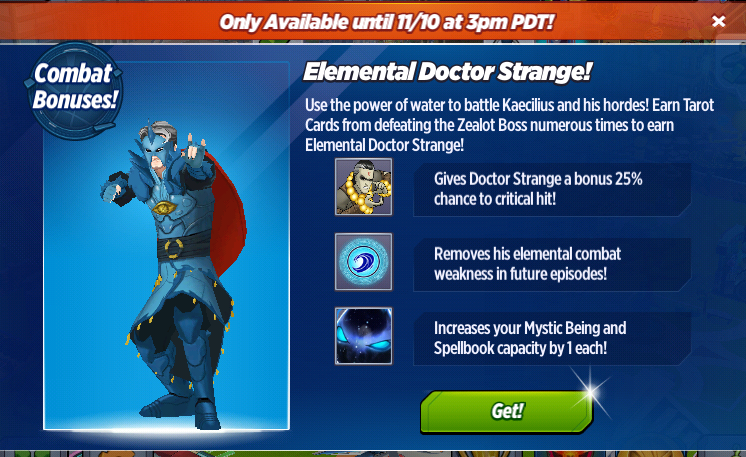 What do you think of Elemental Doctor Strange? Were you able to create this outfit?